[Custom / WIP] TLVN Civic Type R with K20C1 swap! To be honest, I really don’t know what I’m doing LOL. As mentioned on my review of this particular model, this car seems to have been designed with an opening hood. However, possibly because of costs, they may have scrapped the idea. Using Dremel’s cutting saw for removing the metal hood, and the diamond burr for smoothing out any excess, I was able to make my on engine bay on this model. The bay itself was made from Plastic sheets, and was glued/cemented onto the dashboard. Same story with the engine itself, it’s made from plastic sheets. 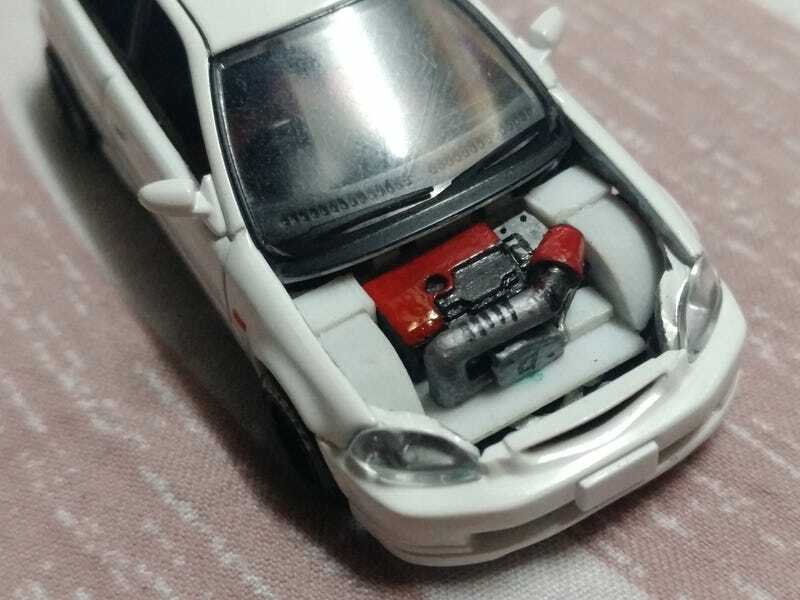 It’s modeled after the engine of an FK2 Civic Type R.
Custom piping and air filters were made using Tamiya Epoxy Putty. A custom V-mounted radiator, front splitters and J’s Racing 3D wing, along with a custom “Gathers” livery will also be added. Custom wheels are also added, which I found on a wheel-swapped Tomica Levin that I bought. It seems to have been sourced from a 1/72.